Our government has in effect been operating the ponzi (pyramid) scheme I outline above. The end result will be the destruction of the U.S. dollar and a serious drop in your standard of living. The government is doing several things that are destroying the dollar, this is just one example of many. 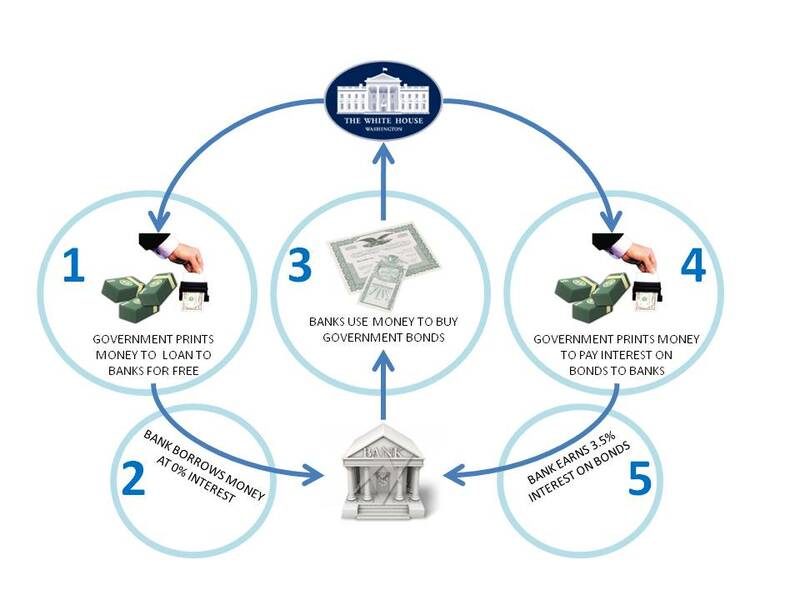 The government prints money out of thin air and offers it to banks at 0% interest. The banks are supposed to use this money to make loans out to everyday people and businesses to encourage growth in the economy, but that’s not what they are doing. And I don’t blame them. Why take a risk like that with some Joe-borrower, when you can borrow the money for free from the government (at no interest) and then buy risk-free bonds from the government that pay you back 3.5% interest. The government in effect gets its own monopoly money back, but now owes 3.5% in interest payments to the bank. This is paid for with more monopoly money. Don’t you wish you could do that? Borrow money for free, then invest it, and sit back and enjoy the interest payments you get. Since the money doesn’t cost you anything, there’s no limit to what you are willing to borrow. You will borrow as much as the lender is willing to give you. So consider what that means. The banks have no incentive to stop using free government money to buy bonds and enjoy the interest payments. As long as the government keeps printing monopoly money, the banks will keep borrowing it. There is no end. Except for one, rampant inflation as all these dollars are created by the government to feed this never ending cycle. Anybody can see that this pyramid scheme the government is running is going to end badly, and the end will be a serious bout of inflation. A flood of dollars will pour into the economy which drives down the value of every single dollar there is, including the ones in your wallet. As the dollar value declines it will take more and more dollars to buy everything from gas to groceries and because the economy is still failing, your income won’t increase to compensate for the loss. This all comes down to a serious decrease in your standard of living. Prices go up while your income stays flat. The specter of unemployment will continue to loom in front of you every morning (unless you work for the government or a union), foreclosures will rise and house values will continue to decline. This is our future, courtesy of our federal government, specifically The Federal Reserve. One more reason to END THE FED.